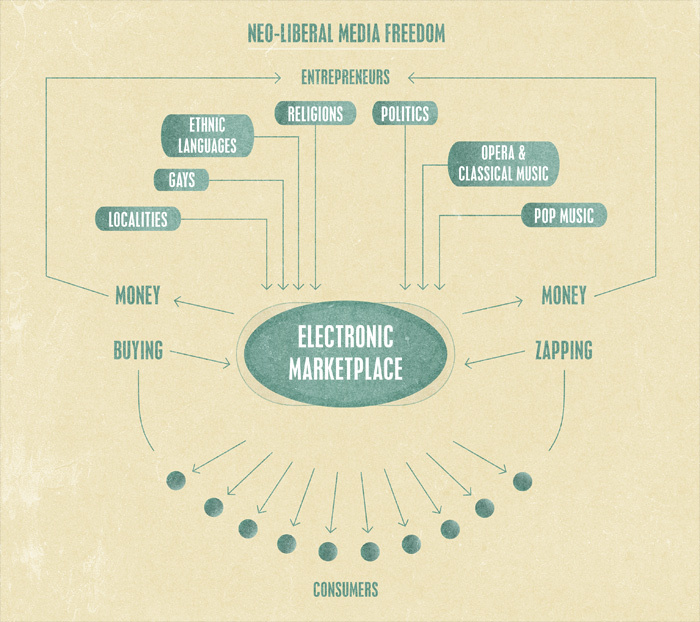 Neo-Liberalism = media freedom of entrepreneurs. The Decline & Fall of the American empire: the barbarians are at the gates. 1973 Arab oil embargo = redistribution of wealth from North to South. 30th April 1975 liberation of Saigon = defeat of US military by South. 1976 UNESCO’s NWIO (New World Information and Communication Order) = global regulation of North’s media for favourable coverage of South. New Left rebellion = youth of North allied with peasant insurgents in South. NWIO = UNESCO support for community media in North. 1975 near bankruptcy of New York = ‘[Gerald] Ford to city: drop dead’. 1977 New York City Blackout = mass looting by ghetto gangs. NYC urban decay: punk rock; hip-hop; The Warriors; Escape From New York. Immanuel Wallerstein, The Capitalist World-Economy. Gabriel Kolko, Anatomy of a War. Sean MacBride, Many Voices, One World. 1969-77 Republican administrations = Old Right v. internal enemies of US elite. Repression of New Left: assassination, imprisonment, infiltration and harassment. Republican Southern Strategy: ‘angry white men’ v. blacks, hippies, feminists and gays -> moral majority of Christians v. libertarian lifestyles of counter-culture -> War on Drugs, anti-abortion campaign and ‘white flight’ to suburbs. Nixon’s New Federalism = wage & price controls + ending dollar/gold convertibility + environmental & workplace legislation. 1974 crisis of Fordism: warfare/welfare state’s failure to manage business cycle -> stagflation = stagnation + inflation -> unemployment and low growth. Old Right -> New Right = revival of pre-Keynesian bourgeois economics. Fordism = national regulation of capitalism by state -> Post-Fordism = global regulation of capitalism by financial markets. 1964 Barry Goldwater = conservative Republican candidate for US presidency. 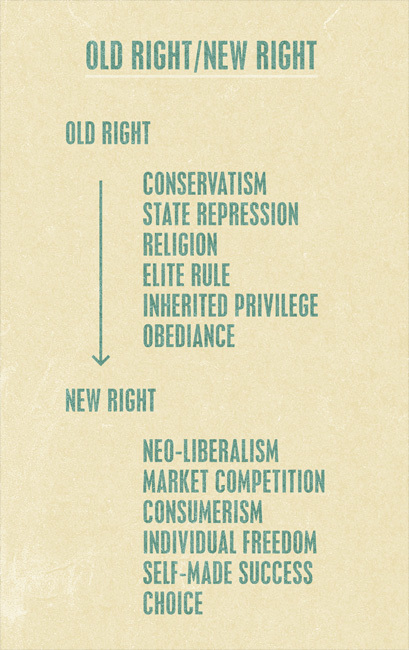 American Right = free market + strong state -> warfare not welfare. Austrian School = 1930s liberal intellectuals in Vienna v. Catholic fascism and Austro-Marxism -> 1940s exile in Britain and USA -> 1947 Mount Pelerin Society: classical liberal economics v. Keynesian consensus = neo-liberal economic theory v. social liberal economic policies. Friedrich von Hayek: individual freedom = buying and selling commodities -> liberal state = gold standard, balanced budgets, law & order and charity welfare. Socialism = regulation of market -> totalitarian state -> economic collapse. Ludwig von Mises’ calculation debate: impossibility of rational economic planning -> market prices = most efficient allocation of the factors of production. Joseph Schumpeter: ‘creative destruction’ of market competition v. stagnation of public and private bureaucracies -> entrepreneurs discovering new products and services = recombining factors of production in more efficient ways. Neo-liberal economic theory of First Amendment: media entrepreneurs of free trade in ideas v. media monopolies of public service and totalitarian states. Friedrich von Hayek, The Road to Serfdom. Ludwig von Mises, Planned Chaos. Milton Friedman and Rose Friedman, Free to Choose. 1950s ‘Chicago School’ = economics department of Chicago University: Milton Friedman, Ronald Coase, George Stigler, Richard Posner. ‘Chicago Boys’ = 1960s American and foreign students of neo-liberal economics -> 1973 Chilean military coup v. Salvador Allende = ‘shock therapy’ v. socialism -> 1980s ‘Washington Consensus’ of deregulation, privatisation and welfare cuts. Neo-liberal globalisation: floating currencies + financial speculation + debt financing + political corruption -> IMF discipline and crony capitalism = reassertion of American hegemony over South. New Right v. New Left in North: 1960s ‘Woodstock Nation’ -> 1980s ‘Me Generation’ = social libertarianism -> economic neo-liberalism. Recuperation of youth counter-culture: hippie communes -> hip capitalists -> yuppie businesses -> corporate brands. New Left v. corporate media -> New Right v. public service broadcasting. Ralph Nader: 1965 Unsafe At Any Speed -> 1971 Public Citizen NGO v. commercial broadcasting: advertising limits, children’s programmes and political pluralism -> UNESCO, Fairness Doctrine and PBS (Public Broadcasting System). Ayn Rand: state media regulation and ownership = scarcity of frequencies -> auctioning frequencies = market competition in radio and television broadcasting. Ithiel de Sola Pool: terrestrial broadcasting = corporate monopolies -> satellite and cable systems = electronic marketplace of different media commodities. McLuhan + Hayek = de Sola Pool. Imminent arrival of the Net = 1970s revival of ‘Jeffersonian democracy’. Neo-liberal theory of First Amendment = low barriers to entry in media markets -> free speech by media entrepreneurs -> market choice for media consumers. Alain Lipietz, Mirages and Miracles. Ayn Rand, ‘The Property Status of Airwaves’ in Capitalism: the unknown ideal. Ithiel de Sola Pool, Technologies of Freedom. 1984 USA boycott of UNESCO = First Amendment media freedom v. NWIO synthesis of New Left, public service and totalitarian models of media freedom. Mark Fowler = 1981-87 FCC chairman: public service media regulation -> regulation for media competition. TV = ‘just another appliance—it’s a toaster with pictures’ not cultural or political. Deregulation of radio and television ownership -> market competition in terrestrial broadcasting. FM format radio = audience segmentation by different music styles: demographics = social class -> psychographics = lifestyle identity. 1960s freeform rock shows -> 1980s AOR (Adult Orientated Rock) format. Recuperation of New Left identity politics = New Right target markets. Successful radio format: more listeners -> increased advertising -> entry of new competitors -> further segmentation of psychographic group -> greater choice. Remote control democracy: viewers zapping between cable TV channels = consumers determining programme content of TV stations. 1982 AT&T divesture settlement: Baby Bells = market competition in telephony. 1984 Cable Act = multi-channel television by local MSOs (Multiple Service Operator). 1987 FCC repealed Fairness Doctrine: market competition = First Amendment. 1980s cable TV boom: deregulation -> market competition between multiple media companies -> crisis of profitability -> mergers and acquisitions -> oligopolistic competition between multi-media monopolies = Time-Warner, NBC, CBS and Turner. Jeremy Tunstall, Communications Deregulation: The Unleashing of America’s Communications Industry. Mark Fowler and Daniel Brenner, ‘A Marketplace Approach to Broadcast Regulation’, Texas Law Review, Volume 60 (207). Kim Fowler, Early ’70s Radio: the American format revolution. Political globalisation of neo-liberal economics: 1973 Augusto Pinochet = Chilean dictator -> 1979 Margaret Thatcher = British prime minister. Tory media policy = strong state and free market -> political propaganda and new information technologies: BBC/ITN/Sun/Telegraph support police v. miners at 1984 Battle of Orgreave and 1989 Rupert Murdoch’s launch of Sky satellite service. 1984 British Telecom sale = privatisation of telephony -> 1984 Cable Act = multiple local operators -> 1990 Broadcasting Act = auctioning ITV franchises. 1966 Institute of Economic Affairs -> 1984 Adam Smith Institute -> 1986 Peacock Report: scarcity of terrestrial frequencies = BBC and ITV broadcasting oligopoly -> abundance of the Net = market competition of ‘electronic publishing’. Hugo Young, One of Us. Adam Smith Institute, Omega Report: Communications Policy. Alan Peacock, Report of the Committee on Financing the BBC. Silicon Valley Model: fierce competition between innovative start-up companies. USA Inc. v. EU and Japan: Fordist industrial economy-> post-Fordist information economy = rapid convergence of media, telecommunications and computing. West Coast hip capitalism: drug dealers and rock musicians -> computer technicians and hi-tech entrepreneurs. Steve Jobs: 1974 Atari games -> Indian pilgrimage and LSD -> 1975 Homebrew Computer Club -> 1976 Apple -> 1984 Apple Mac Superbowl TV advert = individual rebellion v. corporate control. Californian redefinition of VC: 1960s Vietcong -> 1980s venture capitalists. PCs, VCRs, FM radio, mobile phones and bulletin boards = imaginary future of the Net in present. Hippie collectivism of New Left electronic agora -> yuppie individualism of Neo-Liberal electronic marketplace. Alvin Toffler, The Third Wave. George Gilder, Life After Television: the coming transformation of media and American life. Dennis Hayes, Behind the Silicon Curtain.